Poor Todd. He goes away for a week, misses his birthday (yesterday), and returns tonight to a completely rearranged apartment and a wife with a totally different hairstyle. And he has to leave again on Sunday afternoon. I'm concerned that he'll be afraid to come home next week. Who knows what will have changed during his next absence! Meanwhile, the Kiddo has been enjoying her new room. She especially likes pulling all the books and toys off the shelves. And she has recently become obsessed with babies. She's been carrying around various dolls, pretending to put diapers on them and feed them bottles. I think a small cradle might be in order for Christmas. Remember when I was thinking about making lunchboxes using Insul-Bright and iron-on vinyl? 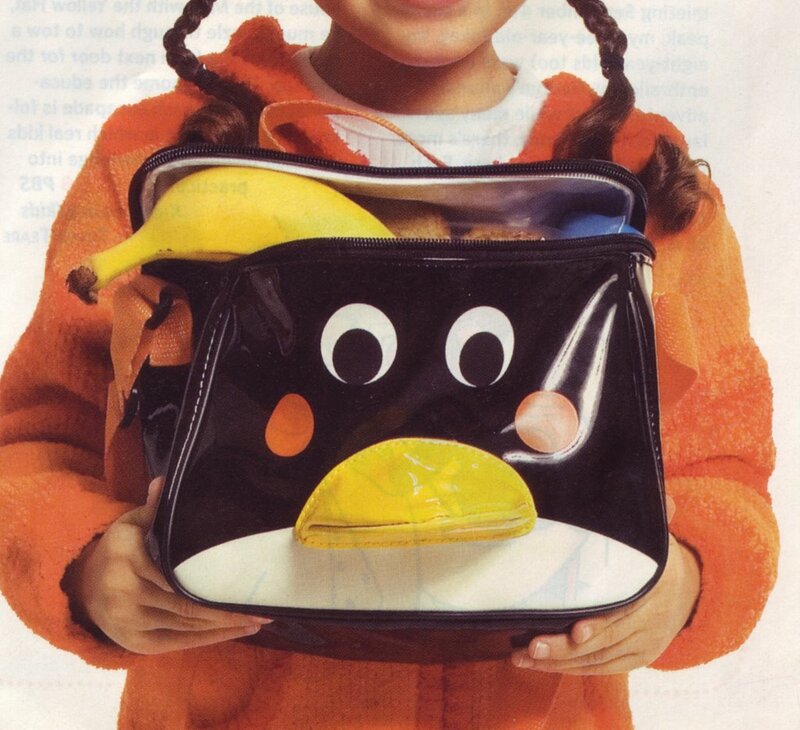 Well, this is the lunchbox that originally inspired me. I wasn't able to find it when I wrote the post but came across the photo the other day. Cute, hmm? Forget the votive candle; wouldn't this make a great bracelet? As far as I can tell it must be crocheted, not knit, right? And I love the proportions and silhouette of this sweater. So great with really wide-legged trousers and flats, the way the model is wearing it. 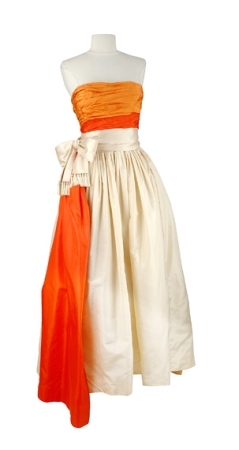 This dress will be part of a textile auction at Doyle. I love the color combination of the creme with the three shades of orange. Wouldn't that be a gorgeous color story for a quilt? Ok, one last thing. If you've already seen this I apologize. But I think it's so clever and funny and creative! I laugh every time I watch it. And did you notice that it runs continuously? They didn't splice portions together; they just let the camera run. Your haircut looks lovely, Liesl! Yeah, I've been drooling over that Anthropologie sweater. Fun new hair! Looks great! 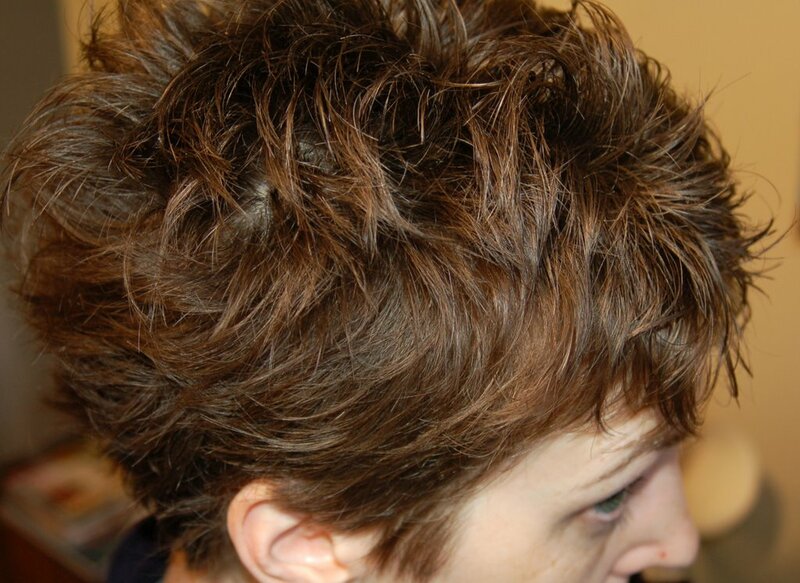 I love the hair -- so fun and funky! We have all watched this video and loved it - thanks for linking to it. I think Simon now wants to wear a pair of white shoes and mess about on exercise machines - for all the wrong reasons. Hello, I'm a new blogger and stumbled across your blog... Can I print out your haircut photo and go to my hairdresser's with it so they can make me one just like yours? I adore your hair. Thank you for sharing the photo. I've been on some crazy grow-them mode for some time now and my hair reaches my shoulders already! It hasn't done that in...Well since 1995 I think. Oh, that's scary. Thank you for saving me. Feel free to visit my humble blog sometime! Love things that you find! I wish Anthropologie would release patterns for their sweaters - they are always the cutest. Awesome haircut! Love the bracelet idea as well.